When I first traveled to Israel-Palestine in 1994, during the heady early days of the Oslo peace process, I was expecting to see more of the joyful celebrations I’d watched on television at home. The emotional welcoming of Palestinian Liberation Organization chairman Yasser Arafat back to Palestine. The massive demonstrations for peace on the streets of Tel Aviv. The spontaneous moment when Palestinians placed carnations in the gun barrels of departing Israeli soldiers. And though the early euphoria had already begun to ebb, clearly there was still hope. It was the era of dialogue. Many Palestinians stood witness to Israeli trauma rooted in the Holocaust. Groups of Israelis began to understand the Nakba, or Catastrophe, when 750,000 Palestinians fled or were driven out of their homes during the creation of Israel in 1948. 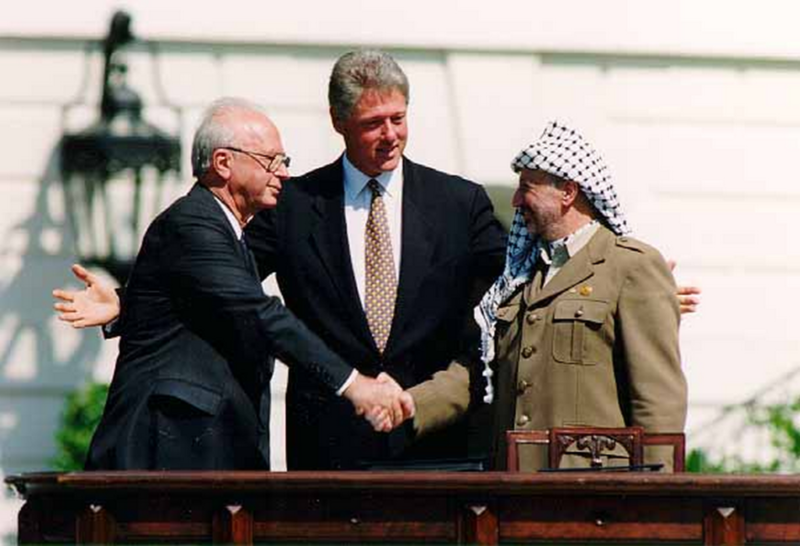 In the wake of the Oslo Declaration of Principles, signed on Sept. 13, 1993 — a quarter of a century ago today — polls showed that large majorities of Israelis and Palestinians supported the agreement. Israelis, weary of a six-year Palestinian intifada, wanted Oslo to lead to lasting peace. Palestinians believed it would result in the creation of a free nation of their own, side by side with Israel. Even then, however, there were disturbing signs. During that first trip, still in the glow of Oslo, I found myself in the heart of the West Bank, driving down new, smooth-as-glass “bypass roads” built for Israeli settlers and VIPs on my way from Bethlehem to Hebron. I was confused. Wasn’t this the territory-to-be of a future independent Palestinian state? Why, then, would something like this be authorized? Similarly, the next year, when Israeli forces undertook their much-heralded “withdrawal” from Ramallah, why did they only redeploy to the edge of that town, while retaining full military control of 72 percent of the West Bank? Such stubborn facts on the ground stood in the way of the seemingly overwhelming optimism generated by that “peace of the brave,” symbolized by a handshake between Arafat and Israeli prime minister Yitzhak Rabin in front of Pres. Bill Clinton on the White House lawn. Was it possible we were witnessing the beginning of the end of generations of bloodshed and trauma? Already, however, there were dissenters. Mourid Barghouti, a Palestinian poet who, like thousands of his brethren, returned from exile in the early days of Oslo, was shocked to find former PLO liberation fighters reduced to the status of petty bureaucrats lording it over ordinary citizens. Another Oslo critic, Edward Said, the Palestinian intellectual and professor of comparative literature at Columbia, refused a White House invitation to attend the signing ceremony between Arafat and Rabin. Or maybe he did. 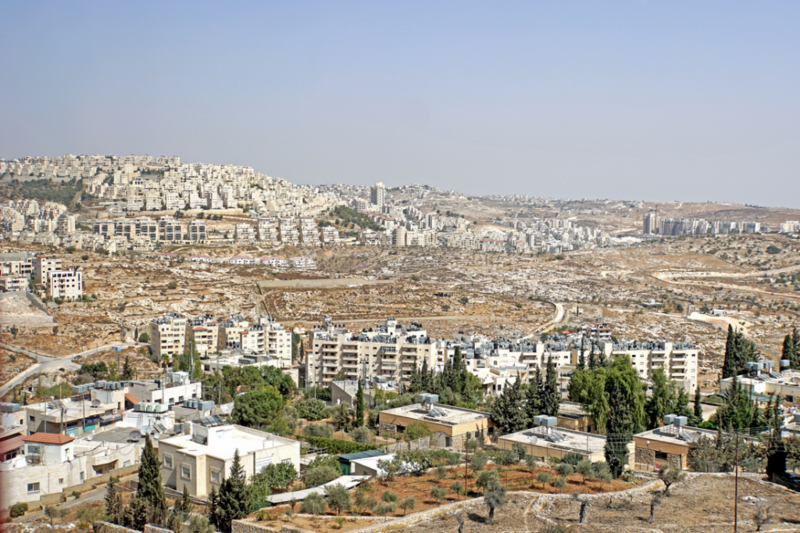 In my nearly 20 trips to the Holy Land over the quarter-century since Oslo, I watched the West Bank settler population quadruple, new settlements come to ring Jerusalem and Israel keep full military control over 60 percent of the West Bank instead of the previous 72 percent. All those settler “bypass” roads and limited troop redeployments turned out to point not simply to obstacles on the road to the culmination of the “peace process” but to fatal flaws baked into Oslo from the beginning. Indeed, the Oslo Declaration of Principles, which mentioned security 12 times but never once independence, sovereignty, self-determination, freedom or Palestine, simply wasn’t designed to stop such expansion. In fact, the accords only seemed to facilitate it. The question worth asking on this 25th anniversary of those accords, which essentially drove policy in the U.S., Israel, the Palestinian occupied territories and European capitals for a quarter of a century, is this: Were they doomed from the beginning? Billions of dollars and endless rounds of failed negotiations later, did Oslo ever really have a chance to succeed? In “Oslo II,” implemented in 1995, Israel got its cherished security cooperation, which meant that Palestinian police would control Palestinian demonstrators and so keep them from directly confronting Israeli forces. Those were, of course, the very confrontations that had helped fuel the success of the First Intifada, creating the conditions for Oslo. Today, that’s a bitter irony for Palestinians who sacrificed family members or limbs for what turned out to be such a weak agreement. But at the time, for many, it seemed worth the price. More important to Arafat was simply to return from exile in Tunisia and then convince Israel to end its settlement policies, give Palestinians East Jerusalem, share the region’s water supplies, and come to an equitable agreement on the right of return for Palestinian refugees dispossessed in 1948. As Baskin, who served as an adviser to Rabin’s intelligence team for the Israeli-Palestinian negotiations, recalls, “I know what kind of direction Rabin was moving in when he agreed to Oslo.” In the early Oslo years, the prime minister’s deputies were at work on secret negotiations with the Palestinians — the Geneva Accords and the Beilin-Abu Mazen agreement — that would have made major territorial concessions and called for East Jerusalem to be the future Palestinian capital. Some Palestinians were not impressed; they noted that by approving of the Oslo accords, they had already agreed to cede 78 percent of historic Palestine, settling for the 22 percent that remained. The West Bank and Gaza. And they pointed out that some settlements remained in both of these unofficial agreements and that neither included any kind of Palestinian right of return — considered by Israelis as a potential death blow to their state and by countless Palestinians uprooted in 1948 as a non-negotiable issue. “There’s so much revisionist history,” Diana Buttu says. She points out that when American settler Baruch Goldstein assassinated 29 Palestinians praying in a mosque in Hebron in 1994, Rabin could have seized the moment to end the settlements. The division of the West Bank into Areas A, B and C, or ostensibly full Palestinian control (18 percent), joint control (22 percent) and full Israeli military control (60 percent), was supposed to be temporary, but it has remained the status quo for a quarter of a century. Whatever the motives and intentions of the Israeli architects of Oslo, they were soon superseded by Israelis who saw the claim of Eretz Israel — all the land from the Mediterranean to the Jordan River — as a prime territorial goal. As a result, the endless expansion of settlements and the creation of new ones, as well as seizures of Palestinian lands in the West Bank and even of individual Palestinian houses in East Jerusalem neighborhoods, has become the endgame for successive Israeli governments, abetted by their American counterparts. And so, steadily, with every new visit to the Holy Land, I would witness the latest evidence of an expanding occupation — new or larger settlements and military bases, more patrols by jeeps and armored vehicles, new surveillance towers, additional earthen barriers, giant red and white warning signs, and most of all, hundreds of military checkpoints, ever more ubiquitous, on virtually every mile of the West Bank. Less visible were the night raids on Palestinian refugee camps and the nearly 40 percent of Palestinian adult males who have spent time in Israeli prisons, where the military court conviction rate for them is 99.74 percent. Also on the increase was the Palestinian Authority’s expanding “security cooperation” with Israel. That, in turn, often pitted Palestinians against each other, embittering villagers and city dwellers alike against the governing P.A. And so, in the post-Oslo decades, even “peace” became a dirty word to many Palestinians. “They thought that this agreement would lead into an independent Palestinian state,” says Ghassan Khatib, whose initial tracking poll, shortly after the iconic handshake on the White House lawn, showed 70 percent Palestinian support for Oslo. But when, he adds, “the public realized that this agreement was not good enough to stop the expansion of settlements, they realized it’s good for nothing. Because the peace process for the Palestinians is about ending the occupation. And settlement expansion is actually the essence of occupation.” Twenty-five years later, his polling finds that support for the “peace process” among Palestinians is now at about 24 percent. The final blow came in May 2018 when the Trump administration moved the U.S. embassy from Tel Aviv to Jerusalem. In the process, it became clear that U.S. Mideast policy is now largely directed not only by the pro-settler triumvirate of Trump son-in-law Jared Kushner, Ambassador to Israel David Friedman and Middle East adviser Jason Greenblatt, but also by the Armageddon lobby. Those evangelical Christians are spearheaded by John Hagee’s Christians United for Israel, which has surpassed the American Israel Public Affairs Committee as the largest pro-Israel group in the United States. They believe that Israel must remain in control of the Holy Land so that Jesus can return and mete out justice to sinners, after which believers will rise to heaven in the rapture. Hagee, who has described such a moment in detail from his pulpit, is a major contributor to the Israeli settlement of Ariel, population 20,000. It was no happenstance that he was the minister who gave the benediction at the U.S. embassy dedication ceremony in Jerusalem in May 2018, as Israeli forces were gunning down unarmed protesters in Gaza. Now, in an effort to end the long-standing right of return of Palestinian refugees, the Trump administration is canceling funding to UNRWA, the U.N. refugee agency that has provided food, shelter, education and housing in the Palestinian refugee camps for nearly seven decades. The move, spearheaded by Kushner, is part of a broader “deal of the century” to pressure Palestinians into a peace agreement on American and Israeli terms. Clearly a bad deal for Palestinians, it is sure to sharply increase poverty and hunger in the camps, especially in Gaza. 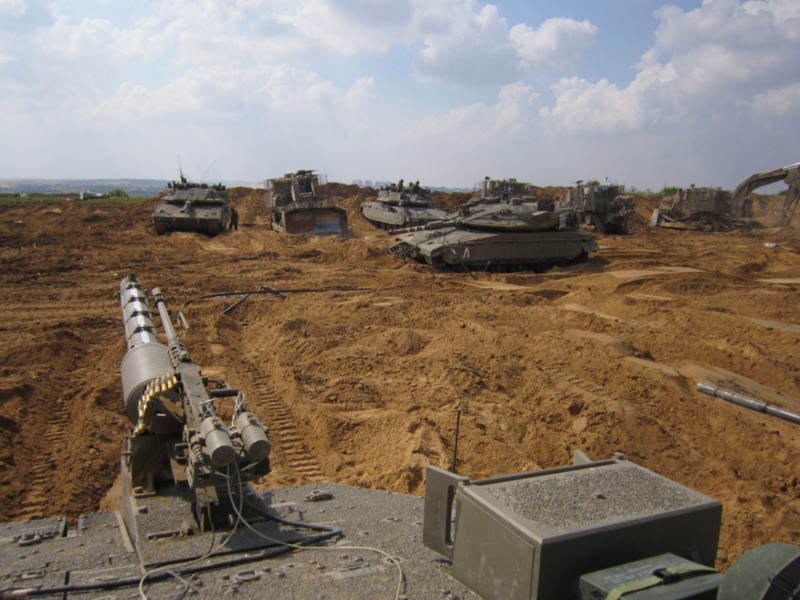 Strategically, it appears to be an attempt to force Gazans to give up their long-standing national rights, while increasing their dependence on humanitarian aid. Many Palestinians see the recent Gaza March of Return and the nonviolent boycott, divestment, and sanctions movement, which advocates cultural and economic boycotts of Israel, as examples of such civil insurrections. BDS supporters recently celebrated a genuine victory, with the announcements by Lana del Rey and 15 other artists that they were bowing out of the Meteor concert festival in Israel. Yet taken together, BDS and the March of Return don’t come close to the First Intifada, a six-year uprising involving virtually every sector of Palestinian society, which brought Israel to the negotiating table — ironically, for the failed Oslo Agreement. Still, few are the Palestinians likely to tell you that the national dream is dead. In late July 2018, for instance, I spoke with Laila Salah, a 21-year-old Palestinian cellist, then rehearsing to play Beethoven’s 9th Symphony in Jerusalem in an orchestra led by Palestinian violist Ramzi Aburedwan, the founder of the Al Kamandjati music school. Many of Laila’s fellow Palestinian musicians, risking arrest, snuck into the holy city, in part to play Beethoven but also to assert their right to be in their beloved Jerusalem, which they still dream of as their capital. When I asked Laila if she thought Palestine would have its own state one day, she compared her people’s freedom to the fourth movement, or Ode to Joy, in the 9th Symphony. Sandy Tolan has been reporting from Israel and Palestine for 24 years. He is the author of the international bestseller, The Lemon Tree, and most recently, Children of the Stone: The Power of Music in a Hard Land. He is a professor at the Annenberg School for Communication and Journalism at the University of Southern California. This story originally appeared at TomDispatch.